A total of 96 records matched your search. 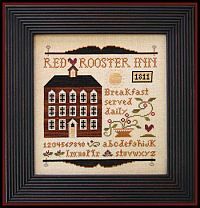 Red Rooster Inn from Little House Needleworks is stitched on 32 count Winter Brew from R&R Reproductions or a fabric of your choice with a stitch count of 118w x 128h using Classic Colorworks hand-dyed fibers with DMC Alternatives provided. 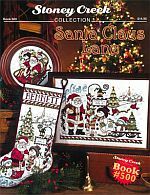 Santa Claus Lane from Stoney Creek Collection features 3 'Santa' designs, the newest 2016 Santa Plate, a stocking and Santa and Friends Gathering, perfect for the winter season. All designs are stitched on 14/28 count Opalescent White fabric. DMC/Anchor threads as well as DMC Color Variations, Weeks Dye Works and Rainbow Gallery Glissen Gloss are used as well as beads from Mill Hill, buttons from Stoney Creek and charms from By Jupiter. 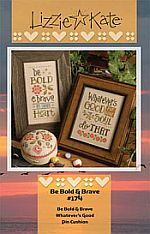 Be Bold and Brave by Lizzie Kate contains 3 patterns stitched on 16/32 count Lambswool or a fabric of your choice. The stitch counts range from 39wx 96h to 57w x 74h. The pattern uses 7 Weeks Dye Works hand-dyed fibers with DMC alternatives available. 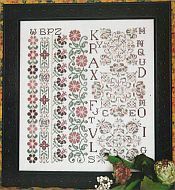 Floral Alphabet from JBW designs is stitched on 16/32 count Antique Ivory or a fabric of your choice. Use the letters individually or stitch as shown with a stitch count of 114w x 148h. The pattern is shown using one Classic Colorworks with DMC alternative but chose your own color to make it your very own. 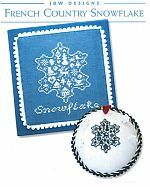 French Country Snowflake from JBW Designs is shown stitched on 32 count Blue Spruce and 28 count Antique White or choose your own fabric for this wintery pattern. The stitch count is 58w x 68h and provides options for Weeks Dye Works, Gentle Art Sampler threads and Classic Colorworks. 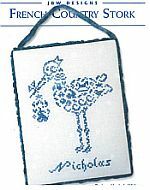 French Country Stork from JBW Designs is stitched on a 32count polka dot fabric from Fabric Flair or a fabric of your choice. The stitch count is 61w x 85h with options for 2 Classic Colorworks with DMC alternatives provided. 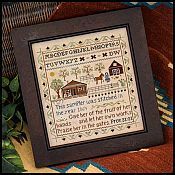 Homestead Sampler from Little House Needleworks is stitched on 32 count Winter Brew from R&R Reproductions or a fabric of your choice. The stitch count is 163w x 175h and uses 6 Classic Colorworks hand-dyed fibers and DMC floss. DMC alternatives are provided for the Classic Colorworks. One More Stitch from Little House Needleworks is a Hoffman Distributing Company exclusive for the 2016 Nashville Needlework Market. It is shown on 30 count Creek Bed Brown from R&R Reproduction or you may choose your own fabric with a stitch count of 77w x 103. The 6 Classic Colorworks hand-dyed fibers are included with this pattern. Letters from Mermaids-R from Nora Corbett is stitched on 16/32 count Waterlily or a fabric of your choice with a stitch count of 110w x 107h. 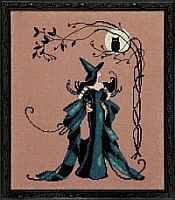 The pattern uses 11 colors of Classic Colorworks and 2 colors of DMC beads. 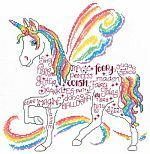 Rainbow Unicorn by Ursula Michael from Imaginating is stitched on 14/28 count white with a stitch count of 145w x 145h using DMC floss. Blessings & Blooms from Sue Hill Designs includes two patterns both stitched on Weeks Dye Works color Linen 32 count or a fabric of your choice. The stitch count for Blessings is 61w x 91h and for Friendships Bloom is 66w x 89h. DMC/Sullivans floss used. 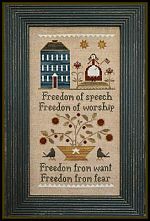 Four Freedoms from Little House Needleworks is stitched on 32 count Creek Bed Brown from R&R Reproductions or a fabric of your choice. 7 Classic Colorworks hand-dyed fibers are used with DMC alternatives provided. 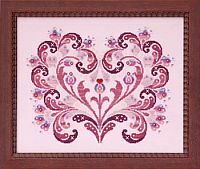 Hearts & Spools from Sue Hill Designs are two patterns stitched on Weeks Dye Works Linen or a fabric of your choice. 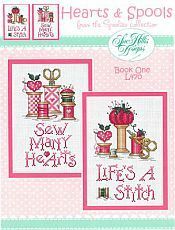 The stitch count for Life's A Stitch is 58w x 92h and for Sew Many Hearts is 52w x 89h. Both patterns use DMC/Sullivans floss. 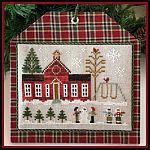 Hometown Holiday-Schoolhouse from Little House Needleworks is stitched on 30 count Natural Northern Cross Linen or a fabric of your choice with a stitch count of 82w x 58h. DMC floss and 3 Classic Colorworks are used with DMC alternatives. 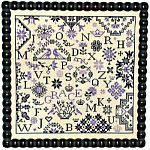 It's all about Mom from Sue Hillis Designs contains 3 patterns all stitched on 14/28 count Antique White with stitch counts of Well Done Mom of 56w x 81 h, Sometimes of 59w x 87h and OMG of 59w x 83h. All patterns use DMC/Sullivans floss. Just Peachy from Rosewood Manor is stitched on 14/28 count Cream with a stitch count of 168w x 191h using Sulky Petite fibers. No DMC alternatives are provided but you may substitute colors of your choice. 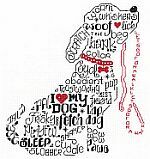 Let's Bark by Ursula Michael from Imaginating is stitched on 14/28 count white with a stitch count of 106w x 100h using DMC floss. Let's Get Styled by Ursula Michael from Imaginating is stitched on 14/28 count white with a stitch count of 137w x 133h using DMC floss. 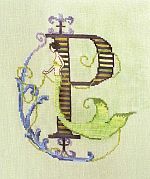 Letters from Mermaids-P from Nora Corbett is stitched on 16/32 count Waterlily or a fabric of your choice. This pattern uses 11 colors of Classic Colorworks hand-dyed fibers and 3 colors of Mill Hill Beads. 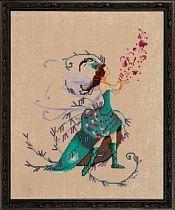 Minerva by Nora Corbett is stitched on 16/32 count Milk Chocolate with a stitch count of 129w x 169h using DMC floss and 4 colors of Mill Hill Beads. 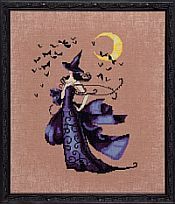 Raven a Bewitching Pixie from Nora Corbett is stitched on 16/32 count Milk Chocolate or a fabric of your choice with a stitch count of 110w x 146h using DMC/Anchor floss and 3 colors of Mill Hill Beads. 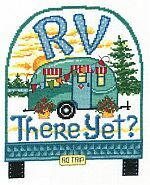 RV There Yet designed by Ursula Michael from Imaginating is stitched on 14/28 count white with a stitch count of 133w x 105h using DMC. 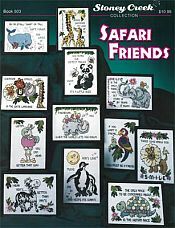 Safari Friends This item is on sale. Safari Friends from the Stoney Creek Collection includes 12 patterns that are stitched on 14/28 count white fabric with stitch counts of approximately 60w x 92h, others 90w x 62h. DMC/Anchor floss are used. Simple Gifts-Grace from Praiseworthy Stitches is stitched on 32 count Vintage Homespun from Lakeside Linens or a fabric of your choice with a stitch count of 212w x 204h using 3 colors of Weeks Dye Works with DMC althernatives provided. 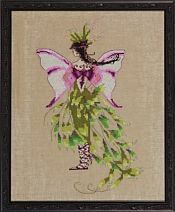 The Leaf Collector one of the Black Forest Pixies by Nora Corbett is stitched on 16/32 count Lambswool or fabric of your choice with a stitch count of 128w x 162h using DMC, 3 Caron Collection Waterlilies and 1 Kreinik #4 Braid. 8 colors of Mill Hill Beads are used. The Moss Collector one of the Black Forest Pixies by Nora Corbett is stitched on 16/32 count Lambswool or a fabric of your choice with a stitch count of 109w x 179h using DMC floss, 4 colors of Rainbow Gallery Silk Lame and one Caron Collection Waterlilies with 3 colors of Mill Hill beads. The Snow Queen This item is on sale. 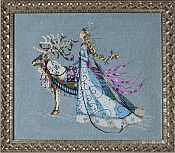 The Snow Queen from Mirabilia is stitched on 16/32 count Twilight Blue or a fabric of your choice with a stitch count of 294w x 243h using DMC floss, 2 colors of Caron Collection Waterlilies, 1 Rainbow Gallery Wisper, 2 colors of Kreinik #4 metallic braid and 12 colors of Mill Hill beads. An embellishment pack containing the bead is available for $54.00. 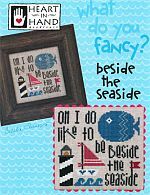 What do you Fancy-Beside the Seaside from Heart in Hand is stitched on 18 count for the easel piece and 28 count Natural linen for the framed piece with stitch count of 63w x 59h. This pattern uses 6 Weeks Dye Works and 4 Gentle Art Sampler fibers with DMC/Anchor conversions. #5 Pearl Cotton fibers are used on the 18 count linen fabric. 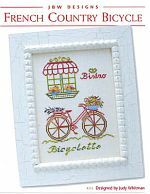 Afternoon in New York by Country Cottage Needleworks is stitched on 16/32 count Waterlily or a fabric of your choice with a stitch count of 207w x 63h. DMC floss is used along with 2 Classic Colorworks, 1 Gentle Art Sampler Thread and 3 Weeks Dye Works fibers with DMC alternatives provided. 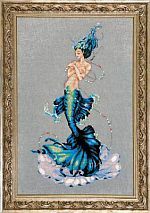 Aphrodite Mermaid by Nora Corbett/Mirabilia Designs is stitched on 16/32 count Twilight Blue or a fabric of your choice. The stitch count is 146w x 264h and it uses DMC floss with 4 #4 Kreinik metallic braid and 5 colors of Mill Hill Beads. An embellishment pack of beads is available for $17.00. 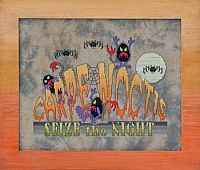 Carpe Noctis from Glendon Place is stitched on 14/28 count Murky from Picture This Plus or a fabric of your choice. The stitch count is 162w x 118h and uses DMC/Anchor or Sullivans floss. ! Caron Waterlillies is used for the moon. 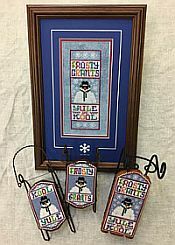 Frosty Grants from Foxwood Crossings is shown stitched on 14/28 count Gothic from Picture This Plus for the framed picture or a fabric of your choice and on perforated paper for the Medium and Large sleds Sleds are available for $9.95 for medium and $12.95 for large. Individual pieces of perforated paper are available for $1.00 each. 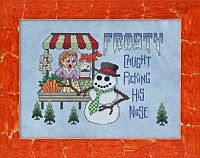 Frosty's Carrot Caper from Glendon Place is stitched on 14/28 count Dwarf from Picture This Plus with a stitch count of 136w x 97h. DMC/Anchor or Sullivans floss can be used. 1 Rainbow Gallery Petite Treasure Braid is used or a gold metallic thread of your choice. 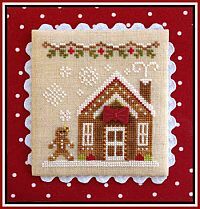 Gingerbread Village #5-Gingerbread House #3 is stitched on 16/32 count Lambswool or a fabric of your choice with a stitch count of 55wx 60h. The pattern uses DMC, 2 Classic Colorworks and 2 Weeks Dye Works with DMC alternatives provided. A gingerbread girl button is available. 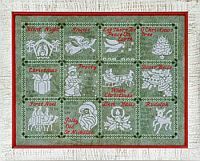 Medley of Carols from Glendon Place is stitched on 14/28 Crystal Conifer from Picture This Plus or a fabric of your choice may be used. The stitch count is 291w x 220h. The designs may be stitched individually with a stitch count of 80w x 80h. A border for the individual patterns is included in the chart. 6 DMC/Anchor or Sullivan floss are used and 3 colors of Mill Hill Beads. 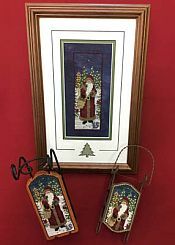 Morning Star Santa from Foxwood Crossings is stitched on 14/28 count Gothic from Picture This Plus for the framed piece or a fabric of your choice. The framed piece has a stitch count of 31w by 84h. The ornaments are stitched on perforated paper with stitch counts of 31w x 75 high for the large sled ornament and 29w x 51h for the medium sled ornament. Large sled is available for $12.95 and medium sled is available for $9.95. Individual pieces of perforated paper available. 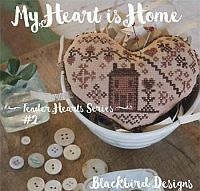 My Heart is HOme, #2 in the Tender Hearts Series from Blackbird Designs is stitched on 32 count Sugar Maple from Lakeside Linens or a fabric of your choice with a stitch count of 71w x 50h using 1 Classis Colorworks and 1 Weeks Dye Works hand- dyed fibers. 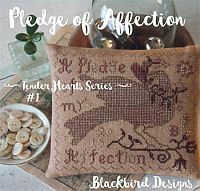 Pledge of Affection the first of the Tender Hearts Series from Blackbird Designs is stitched on 32 count Mocha from Weeks Dye Works or a fabric of your choice. 2 colors of Classic Colorworks and 3 Weeks Dye Works fibers are used. 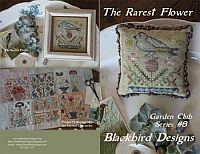 Rarest Flower # 8 of the Garden Club series from Blackbird designs is stitched on 32 count Weeks Dye Works putty or a fabric of your choice. 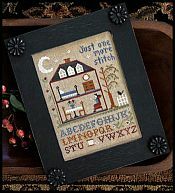 The stitch count is 65w x 65h and the pattern uses 12 Gentle Art Sampler hand-dyed fibers with DMC alternatives available. This pattern can be stitched alone or with the other patterns in this series. 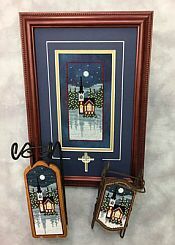 River Road Church from Foxwood Crossings is stitched on 14/28 count Gothic from Picture this Plus or a fabric of your choice for the picture with a stitch count of 37w x 80h and 14 count perforated Antique Brown perforated paper for the ornaments, large sled 31w x 75h and medium sled 29w x 51h. The large sled is available for $12.95 and the medium sled for $9.95. Perforated paper is also available. Simply Love from Glendon Place is stitched on 16/32 count Bashful from Picture This Plus or a fabric of your choice with a stitch count of 194w x 160h using Dinky Dyes fibers, one Sullivan floss with DMC alternative and one color of Mill Hill Bead and MH Treasures. 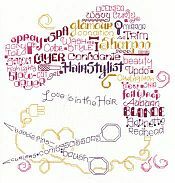 A Dinky Dyes thread pack is available for $45.00 and Embellishment pack for $12.00. 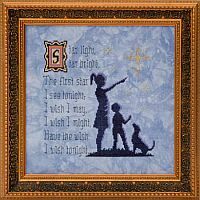 Star Light, Star Bright from Glendon Place is stitched on 14/28 count Jay from Picture This Plus or a fabric of your choice with a stitch count of 116w x 118h using DMC/Anchor/Sullivan floss. 3 colors of Kreinik #4 Braid are used. 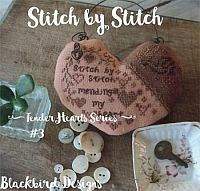 Stitch by Stitch #3 in the Tender Heart Series from Blackbird Designs is stitched on 32 count Clay Pot from Lakeside Linens or a fabric of your choice. The stitch count is 62w x 51h and utilies one color of Classic Colorworks and 2 Weeks Dye Works hand-dyed fibers. 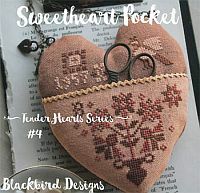 Sweetheart Pocket #4 of the Tender Heart Series is stitched on 32 count La-D-Da Brown by R&R Reproductions or a fabric of your choice with a stitch count of 56w x 20h and uses 1 Classic Colorworks and 2 Weeks Dye Works hand-dyed fibers.